Germany/Swiss/Austria. Constanz City. Anonymous 16th century. Silver 1/2 batzen. 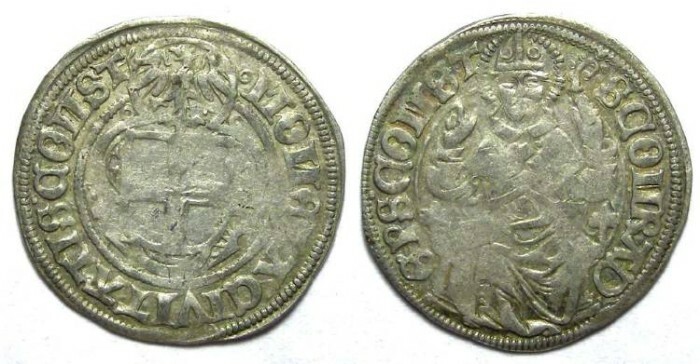 The city of Constanz is currently considered to be a German city, but at the time this coin was struck the city was in Swiss territory, although it was not considered a Swiss city. It was in independant Imperial city before 1548, and an Austrian posession for a while after 1548, and since this coin cannot be dated that precisely it is difficult to say to which country this particular coin should be assigned now. Date : 16th Century, probably after the mid 1520's. Size : 22.0 x 22.8 mm. Weight : 1.63 grams. Obverse : City arms with MONETA CIVITATIS CONST around. Reverse : Saint Conrad of Constance seated, with S CONRAD EPS CONST around. Saint Conrad was the Bishop of Constance from AD 934 to 975.